I love all types of musicals, of course I do, but funny musicals are the ones that I am most picky about. If I don't find the premise of the show funny or I just find the show generally corny then I'll find it hard to like the music as well and generally, the show will fall off of my radar. I saw Spamalot on tour a few months back and though I didn't despise the show by the end of it, it's definitely no where near the best I've ever seen and I doubt very much that I would go and see the show again. I'd heard many comparisons between Spamalot and Something Rotten! which made me wonder if I was actually going to enjoy SR! as much as all of the audiences were saying they were... and I'm so glad to say that I did; I really, really did. 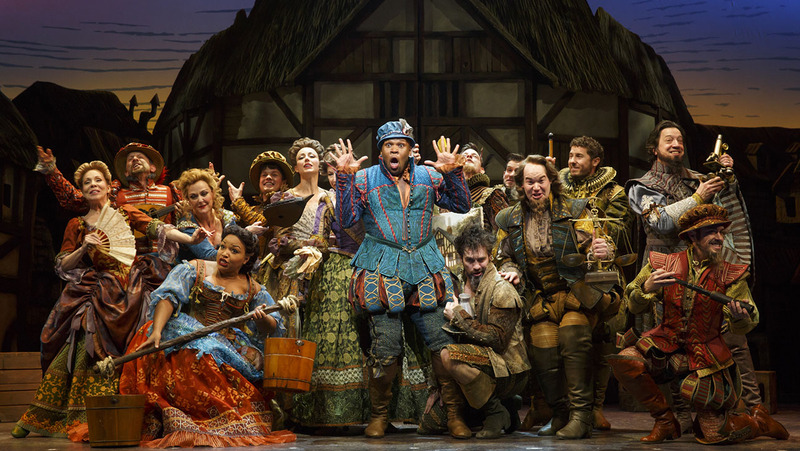 For those who don't know the back story to the show, Something Rotten! tells the fictitious story of the Bottom brothers (played by Tony Award-nominee Brian d'Arcy James and John Cariani) and how they created the world's first musical. They Bottom brothers have been working in the shadow of Tony Award winner Christian Borle's portrayl of William Shakespeare and follows the brothers concieving the show (with the help of Nostradamus, played by Tony Award-nominee Brad Oscar), Nigel Bottom's relationship with his wife (played by Heidi Blickenstaff) and Nigel Bottom's blossoming, forbidden relationship with Portia (played by Kate Reinders). The music from the show is genuinely funny which was a big selling point for me. Not only were the songs catchy and had the perfect blend of the feel of modern musical theatre songs and classic theatre music, but the way it was performed on stage seriously brought shivers down my spine; Heidi Blickenstaff's song Right Hand Man at the start of the show was performed was such incredible belt that tears seriously came to my eyes, whilst the show's most iconic song called A Musical is everything you could hope for from a song in a Broadway musical and more; it's hilarious, filled with kick lines and is insanely catchy. The set had a similar lasting affect on me too - what other show starts with an arch around the stage that looks like a tudor cottage, or where there are actual Tudor houses on the stage that open with people inside? It was just stunning. Everything about this show was stunning and perfect. When I first saw the show, I left the theatre knowing that I'd seen something special but when my Dad told me that it was the best thing he'd ever seen, I couldn't quite form a proper opinion on that just yet. Now though, looking back, Something Rotten! really is one of the best things I have ever seen in my life. It was so Broadway musical, so witty and charming and so generally warm and inviting that I almost booked up to see the show a second time during my short stay in New York. As soon as this show gets its rumoured London transfer, I urge you (nay beg you) to book tickets to see it. It's not one to miss.